Acknowledged author wrote DEVELOPING PERSON THRU THE LIFE SPAN 10 comprising 960 pages back in 2016. Textbook and etextbook are published under ISBN 1319015875 and 9781319015879. Since then DEVELOPING PERSON THRU THE LIFE SPAN 10 textbook received total rating of 4 stars and was available to sell back to BooksRun online for the top buyback price of $59.86 or rent at the marketplace. 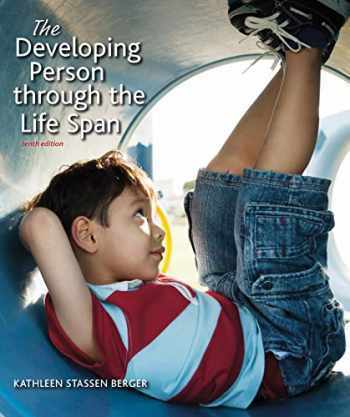 Kathleen Berger’s acclaimed survey of developmental psychology across the life span is always up to date, always inclusive of cultures from every corner of the globe, and always compelling in the way it shows students the everyday relevance of field’s theories, ideas, and discoveries. With its new edition, the text becomes a more deeply integrated text/media resource than ever, with the book and its dedicated version of LaunchPad combining seamlessly to enhance the learning experience. But driving that experience, as always, is the clear, engaging voice of Kathleen Berger, revealing the connections between the study of development across all stages of life and lives that students actually live. New Media OptionAchieve Read & Practice, combining a complete e-Book with LearningCurve adaptive quizzing. For more, see New to this Edition.